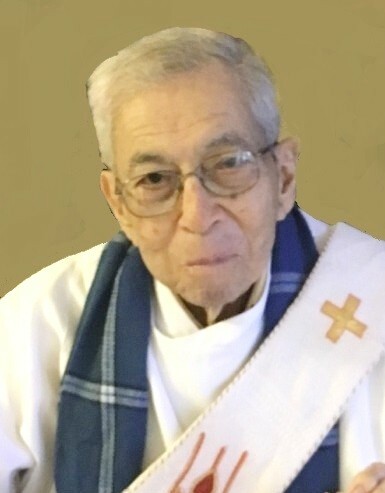 Deacon Jose “Joe” Angel Solis, 88, entered eternal rest on Sunday, September 30, 2018 at 11:27 with his loving family by his side. He has now rejoined his beloved wife; Estella. He was born on Sunday, April 20, 1930 in Sullivan City, Texas to Jose Solis and Anastacia Luna Solis. He is preceded in death by his parents, wife, brother; Enrique Solis, sister; Estela Solis Rodriguez and sister-in-law; Delfina Solis. Left to cherish his memories are his sons; Jose A. (Iris Ann) Solis, Jr., Javier Rene Solis and David (Florenda) Solis, daughters; Velma Nora Solis Garcia and Maria Dalinda Solis, grandchildren; Emmeline Grace (Joel) Garcia Garza, Adrianna Michelle Solis and Adrian Emilio Solis Villarreal, great granddaughter; Jasmine Grace Garza, brother; Rodolfo Solis, sisters; Florinda (Estanislado) Rodriguez, Carmen (Enrique) Rodriguez, and Esperanza (Santos) Lopez, brother-in-law; Victor Rodriguez, numerous nieces, nephews and God children. Joe lived in Edinburg most of his life and proudly served his country in the Army Air Corps. He worked as a bookkeeper for TIDE Products and a salesman for Montgomery Ward for many years. He, faithfully, alongside his wife, served Church in ministry for over 50 years. He was a wonderful husband, father, grandfather, great grandfather and friend to many. He was very humble, caring, loving and honest man. He was a very simple man who devoted all his time to God, family and church. He always felt the need to serve others before himself and blessed everyone who came into his path. He will be greatly missed, but will always be cherished by his family, friends and all whose lives he touched. The Solis family received friends on Tuesday, October 02, 2018 from 5:00 PM – 9:00 PM with a Rosary prayed at 7:00 PM at Sacred Heart Catholic Church, 501 East Kuhn Street in Edinburg. Catholic Mass will be celebrated on Wednesday, October 3, 2018 at 10:00 AM at Sacred Heart Catholic Church in Edinburg with Bishop Daniel Flores, Fr. Kumar, Fr. Cris and Fr. Richard officiating. Catholic burial will follow to Hillcrest Memorial Park Cemetery, 1701East Richardson Road in Edinburg. Having the distinguished honor to serve as pallbearers will be: Dan Rodriguez, Aaron Rodriguez, Homer Solis, Jr., Rolando Flores, Sr., Santos Castilleja, III, and Victor Rodriguez, Jr. Funeral services have been entrusted to Johnny Garcia, Manager/Funeral Director and Staff of Ceballos-Diaz Funeral Home in Edinburg. | 322 East Kuhn St.